All Chicago is a collaborative partnership of the Chicago Alliance, the Emergency Fund and the Learning Center. The partnership works with an extensive system of community resources, providing stability and support to individuals and families in Chicago who face crisis, are without a home and its related benefits. Using a collective impact approach on homelessness, the partnership works to create and support housing solutions in Chicago while improving resources for service providers with one goal: making homelessness history. Chicago has made great strides to help the 6,500 Chicagoans who don't have a place to call home. The city uses a scattered approach for its 50 shelters, located throughout the city rather than a single concentrated area. The aim of all Chicago is housing-first, rather than long-term shelter services. Additionally, most shelters assist specific demographics, such as domestic violence victims, singles or families. This allows for greater individualized attention and targeted programs. Dr. Nonie Brennan, President and CEO of Chicago Alliance and Alisa Rodriguez, Assistant Director of the City of Chicago's Department of Family and Support Services led the discussion. The story of the Great Chicago Fire of 1871 isn't really about the fire. It's about what happened next: a remarkable moment when the most brilliant engineers, architects and inventors came together to build a new city. This is the mission of 1871, an entrepreneurial hub for digital startups with over 70,000 square feet of space. 1871 is home to Chicago's brightest digital designers, engineers and entrepreneurs are shaping new technologies, disrupting old business models, and resetting the boundaries of what's possible. It is all made possible by 1871 space itself, which provides a sense of community, inspiration and technical resources. Urban exploration participants toured the space with 1871 Director of Memberships Manny Ozaeta. MATTER, also located in Chicago's historic Merchandise Mart down the hall from 1871, is a community of healthcare entrepreneurs and industry leaders working together in a shared space to individually and collectively fuel the future of healthcare innovation. Healthcare IT, medIcal devices, diagnostics and biopharma leaders have a space to collaborate and create. Matter opened just 7 months ago with $4 million from the state of Illinois. Urban exploration participants toured the space with MATTER Director of Member Experience Dr. Maryam Saleh. The 606 is a decade in the making. As train traffic slowed on the Bloomingdale Line in the 1990s, attention turned to how the train line might be used to increase much-needed green space. The City of Chicago brought residents together to discuss an area of particular concern- Logan Square, a neighborhood that, at the time, had the least amount of open space per capita of any in Chicago. Estimated to be completed in June 2015, the 606 is an innovative project that will transform nearly three miles of unused rail line into the elevated Bloomingdale Trail, which will be linked to six ground-level- park. Set above city streets, it will serve as a new way to explore Chicago on trails for biking, running and strolling. Parcipants had the opportunity for an exclusive hard hat tour of the line with the Chicago Park District and private funders. Walking tour of Pilsen's Murals. Brick walls make for sturdy structures. They also make an excellent canvas. In Chicago's lower west-side, the Pilsen neighborhood organized an initiative with the Chicago Urban Art Society to display murals by internationally recognized street artists. First inhabited by Czech immigrants in the late 19th century, Pilsen is now the heart of Chicago's Latino community. From tile mosaics in the sidewalks to massive murals that depict the histories of Mexico and Pilsen, the neighborhood is full of culture and history and a leader in Chicago's arts scene. The Declaration of Immigration mural is collaboration between teaching artist Salvador Jimenez and other young artists. Many immigrants live in Pilsen and this mural and this mural reminds us that we are all human beings and contributes to the national discourse on immigration. Franciso Mendoza was commissioned in 1993 to transform the Pink line station by painting a mural depicting Mexican women of different generation including a Mayan princess. On the corner of 19th and Ashland above a laundrymat you'll find this piece created in 2001 titled "Oh, The Things You'll See" in English. 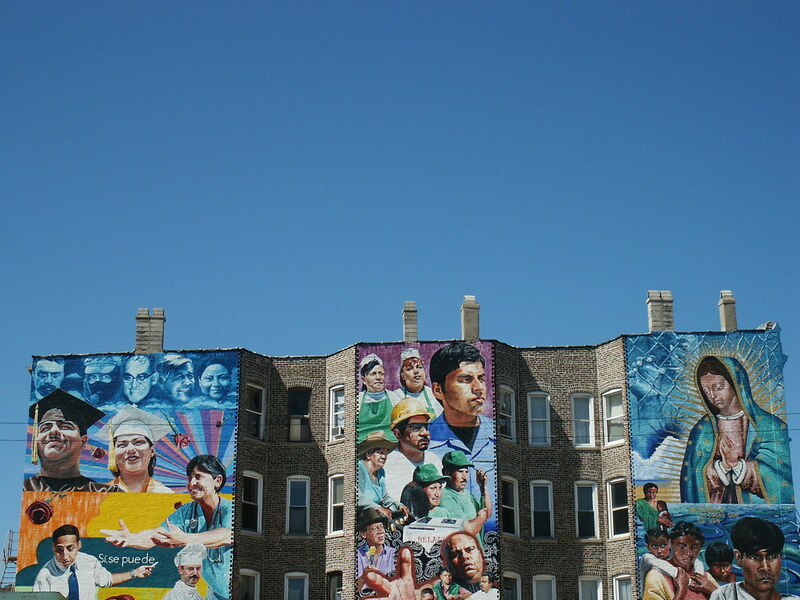 Zimmerman's work is known for using "photo-realistic" images and capturing people who live and work in Pilsen. Also, he includes political messages in his work.